In an effort to give my healthy, homemade lunches more variety I’ve been looking for different carbs/starches to substitute for my usual roasted potatoes. 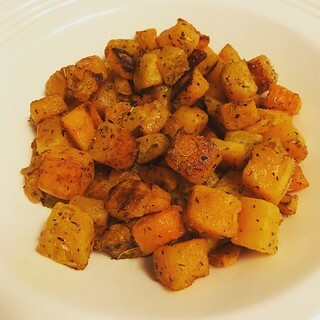 I’ve never been much of a potato enthusiast, but I love simple diced and roasted white potatoes and sweet potatoes. I ate a lot of them when I was doing my Whole30-ish diet in October. But as much as I enjoy them, I need other options for my weekday lunches so that I don’t get completely burned out on potatoes. While I was in Tallahassee for Christmas I tried out a recipe for mashed butternut squash and it was only semi-successful, mostly due to the fact that I was too lazy to use a food processor. (Note: Mashing roasted butternut squash with a fork doesn’t really work, nor does blitzing it with an electric mixer.) But in spite of its weird texture, the flavor of the partially mashed butternut squash was outstanding, so I saw some potential for a tasty and less complicated version. I basically just used the same ingredients, olive oils and minimal seasonings, but didn’t do anything else after the roasting step. What could be simpler? I make this every couple of weeks and it’s the perfect side dish for just about any meal. Put the diced butternut squash in a large bowl. (I buy pre-diced butternut squash for convenience. 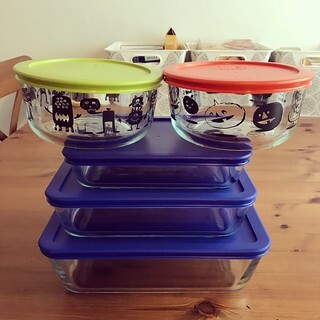 My time is valuable-ish and this helps make my healthy lunches more achievable.) Add the olive oil, salt, Italian seasoning, and pepper and stir to combine. Bake at 375 deg F for about 30 minutes, stirring once about halfway through, or until tender and slightly browned. The duration required will depend on how large the pieces of squash are. The Green Giant variety that I usually buy is a small dice, less than 1 inch per piece, so it took less time than the recipes I researched. Enjoy! Based on Momtastic’s Roasted Butternut Squash. On Friday we had our annual chili cook-off at work. It’s one of my favorite days of the year. Good food, happy co-workers, and Halloween decorations. What could be better? It’s always so much fun. I think I said it best last year when I mentioned that we don’t feel like we get a lot of credit for all of our accomplishments. We really need morale events like the yearly chili cook-off to keep from burning out. It doesn’t cost our program anything and everyone loves it. The participants are always so grateful that we have it, and it’s a fantastic way to celebrate Halloween at work. This year I did something a little bit different with my cook-off entry and made it inspired by of Cincinnati chili. Usually Cincinnati chili is served over spaghetti, but I skipped that part because it didn’t really make sense for a buffet-style meal (or for folks cutting carbs). Instead I simply threw in some of the typical Cincinnati chili spices – cinnamon, allspice, and cocoa powder. It was delicious! 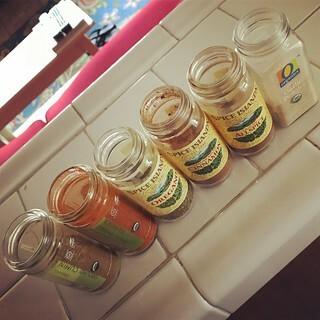 I had to make a couple of batches to get the amounts of all the spices just right, but I think this recipe is a winner. I didn’t win the chili cook-off (that honor always goes to one of the spicier chilis), but I still loved the unique flavor. 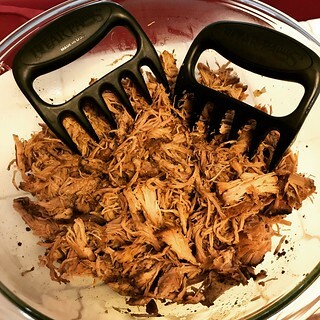 It’s just different enough from my traditional chili for me to call this a new recipe! In a small bowl, combine the spices (chili powder, cumin, paprika, oregano, allspice, cinnamon, salt, garlic powder, and black pepper) and cocoa powder and set aside. This will save you time and trouble later. 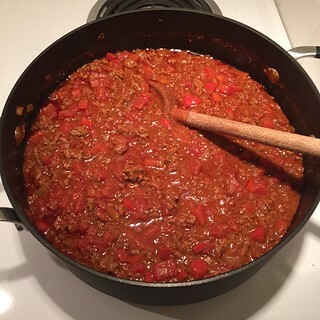 In a large pot (I use my aptly-named 5 qt chili pot that I love) cook the ground beef, onion, and bell pepper until the meat is no longer pink. Add the bowl of spice mix from earlier and cook, stirring frequently, until fragrant, about 2 minutes. Add the apple cider vinegar, Worcestershire sauce, diced tomatoes, and tomato sauce and stir to combine. If you are adding beans you can throw them in now too. (I left the beans out of my chili cook-off batch so you can skip them if you want.) Bring the chili too a boil and then reduce heat to a simmer. Put the lid on the pot, but leave it propped open a bit so steam can escape. Cook for at least an hour, stirring about every 15 minutes. Enjoy! Based on Half Baked Harvest’s Healthier One Pot Cincinnati Chicken Chili.